The Serial Killer Epidemic: Interview Transcripts is my FINAL DIALOGUE for the series. This means that I’ve written my whole short story collection! Yesterday’s post was actually my 52nd dialogue . . . I just didn’t realize my count was off. So this 53rd dialogue is the last piece I’m adding to my 2018 writing challenge. Now that doesn’t mean as I’m finalizing my short story collection that I won’t write another dialogue or two (or dredge up some old piece of writing and convert it into a dialogue). I do have dialogue ideas I just never got around to writing. Out of all the stories I’ve written over the years, The Serial Killer Epidemic: Interview Transcripts is one of my favorites. Like Expire and The Defining Attribute of a Girl, I actually wrote this piece years and years ago. In fact, I wrote this story even before marijuana was legalized anywhere in America. I guess I felt it coming, since legalized marijuana features so prominently, though my fictional trajectory toward legalization is rather different than it is historically happening. It surprises me really that this story hasn’t been picked up anywhere yet. Maybe it’s too sci-fi for most literary publishers? Possibly it’s too experimentally literary for most hard sci-fi publishers? Or maybe it has a flaw that 25 drafts hasn’t smoothed out (if there is a flaw, I’m not seeing it)? But I’ll keep sending it out because I really want this dialogue, this short story to appear in print somewhere. And I’m pretty much set on only publishing it in a paying market, which is likely the real reason it hasn’t yet found a home, since places that actually pay writers for the work they do are extremely competitive. The Serial Killer Epidemic: Interview Transcripts is a story in Q&A format. The interviewer, is trying to get to the bottom of a wave of child serial killers. Drugs to video games are blamed. But the truth may be more complex and conspiratorial or—worse—simple and endemic to the nature of modern society. This is just an interview; you’ll have to decide for yourself is the answer lies in between or outside these questions and answers. FINAL THOUGHTS: I just want to thank everybody who has given so much as one like to any of my posts about this 2018 writing challenge. I’ll be working hard to polish up my 52+ dialogues so I can get some more of them published here and also have a book ready to send out to publishers or agents at the end of 2019. This isn’t the last you’ll hear of my dialogues, but it is the last official post of my writing challenge. So thank you again for reading, liking, subscribing, and commenting. 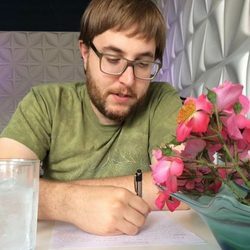 It’s been an awesome writing journey. In this dialogue, a policeman tries to understand the otherworldly horrors experienced by a woman whose husband has been killed by a strange monster roaming the countryside. To learn more about my creative dialogues, please visit this page. There are a number which are free to read online. Dialogue #50 for my year-long writing challenge is Ho Ho Ho, Mother-Fucker. When two friends run into an evil Santa, hell-bent on mayhem and murder, they cut him down to size with a critique of the transgression Santa Claus trope. Evil Santa Claus pictures on The Church of Halloween’s website. When trying to figure out whether to hyphenate mother+fucker or not, I found this cool little article on Language Log. Lastly, a short Loose Canon episode from Lindsay Ellis on the history of Santa Claus. As I was writing this blog (on Christmas Eve here) I got an interesting phone call, which I made a post about on Facebook and captured an image of it for you. Don’t forget to check out some of my Christmas stories before you go! For dialogue #49, I’ve written We Toss ‘Em, a story about two men who are taking out a hoarder’s trash. Dino fossils* are found, but regulations say they must toss ’em into the trash. *My apologies to any paleontologists who run across the story once it’s published. The two men involved call the fossils dinosaur bones, which is inaccurate. My excuse? Well, I’m going for realism of speech, not accuracy of facts in this one. If you take issue with my fictional perpetuation of a common enough mistake, please make no bones about it, pardon the pun, and leave a comment below. To learn more about my dialogue challenge, please see this page. This week’s dialogue is God Vomit, a creative conversation concerned with the possibility of a strange, godlike Boltzmann Brain. If you don’t know what it is, a Boltzmann Brain is a self-aware creature created from a random configuration of elements and atoms rather than through other means, such as evolution or genetic engineering. Basically, it’s a creature arising from chance. It’s a cool concept, and one I felt worth exploring in this dialogue. This is dialogue #48. On my first week of the challenge I wrote an introduction, so I’ll have one to make up some week soon. The truth is, I have more dialogue ideas left than there are weeks in the month. So either I’ll scratch off an idea or two, write extra dialogues before the year is over, or just write them after the new year for inclusion in the future published collection. Find more about my weekly dialogue writing challenge here, Dialogues: A Collection of Creative Conversations. Image from a great article on an actual abandoned amusement park. URBAN EXPLORING: Enchanted Castle is a dialogue about the depths of enchantment. Two urban explorers enter into an enchanted castle but find not the dilapidated magical charm they anticipated. Instead, they encounter the enchanted remains of a decaying nightmare. These are the last weeks of the dialogue challenge. I am amazed at myself for sticking it out even in my busiest weeks. I’m even more humbled knowing that there are writers out there who manage to write a blog or article post multiple times a week. I really don’t know how you do it, but I applaud you. For those who are wanting to read some new dialogues, stay posted and subscribe to get email notifications. My focus is on getting the last dialogues written, then I’ll start to type up whatever is still in pen and paper drafts, edit, and send my pieces out. There are some dialogues submitted here and there, so who knows, it’s possible something new will be published soon. If there is, I’ll do a post when it’s published.